In 1921, Vickers-Armstrong developed a project for the Vickers Light Tank. The 1923–1924 trials showed that the tank was ready for mass production. 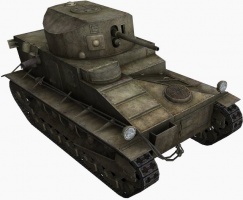 In 1924, the vehicle was renamed the Vickers Medium Tank Mk. I. The same year, a total of 30 vehicles were produced and entered service. Another 50 vehicles of the Mk. IA modification were manufactured later. The Vickers Medium Tank remained in service until 1938. The Vickers Medium Mk. I is the only Tier 1 medium tank. Both of its guns are very good for tier 1, but unfortunately it has severe limitations in many other respects. It has the worst armour of any tier 1, it is very slow, and it is a medium tank so it does not keep its camo bonus while moving making it easy to detect. It's best not engage in close quarters using the Medium I because tanks with auto cannons or machine guns will easily do full damage and destroy you very quickly. It is recommended to try and provide medium range support, as the top gun's damage is devastating (70 points average) and for a tier 1 it is somewhat accurate (0.52 at 100m). Both guns are excellent: 3 pdr for accuracy and 6 pdr for raw power (The HE Shells can practically wipe out all tier Is). Has a full 5 man crew (Most others in its class have 2-3). Highest HP pool of tier I. Absolutely ridiculous size (Some heavies have a higher camo rating!). Armor can be penetrated by a pellet gun (Autocannons are instant death). Very sluggish, can't get out of its own way. 3 pdr has a longer aim time than the 6 pdr and slow shell velocity. Can no longer mount the dreaded 15mm BESA Machinegun. One would think that as the only medium tank of Tier 1, the Vickers Medium Mk. I would be expected to be more heavily armed, less mobile, but more heavily armoured than its Tier 1 counterparts. The first two are quite true, but the third is unfortunately not. With a maximum armour thickness of 6 mm, the Medium Mk. I has the thinnest armour of any tank in the game, excluding the M56 Scorpion. Any gun will easily penetrate the armour, while high explosive rounds will almost certainly do full damage, wrecking the Mk. I. Under no circumstances must the Mk. I engage in close combat with other tanks armed with autocannons, as they will rip the Mk. I to shreds, turning the armour plates into swiss cheese in seconds. Besides the thin armour, the Medium Mk I is very sluggish and unmaneuverable. It is very vulnerable to being circled by other light tanks, exacerbated by the relatively slow turret traverse. The Vickers Medium Mk. I has a choice of two guns. It starts off with the OQF 3-pounder Mk. I, which has the best accuracy of any Tier 1 gun, which is counterbalanced by the very long aim time. With APCR, it also has the best penetration of the Medium Mk. I's guns. The second gun is the QF 6-pounder 8 cwt Mk. II. 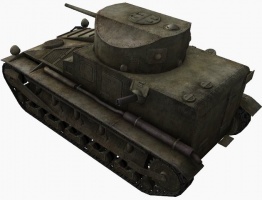 The gun packs a huge punch, and is capable of killing any Tier 1 tank in two shots. This is counterbalanced by its horrible accuracy, although it does have a fairly good aim time. Despite having the most hit points of any Tier 1 tank, the Medium Mk. I, is also a lot larger than any of the other Tier 1 tanks and is a very attractive target. 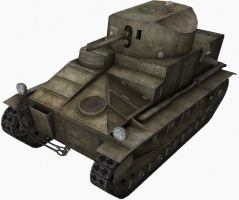 It is generally best to stay behind the main force and support them from behind, trying not to be spotted, or fight in urban areas, staying behind better armoured tanks like the Renault Otsu, Renault FT, and NC-31, providing support fire and using buildings as cover for reloading and to hide the massive hull. The 3-pounder is accurate enough (by Tier 1 standards) to snipe at fairly long distances, while the 6-pounder, despite its inaccuracy, can be used as a sort of pseudo-artillery to bombard enemy tanks at long distances. The only thing you can research (apart from other tanks) is the second gun, so get that. After the First World War Britain disbanded most of its tank units: their number was limited to five tank battalions, equipped with the Mark V and the Medium Mark C. A large budget was at first made available for tank design; this was however all spent on the failed development of the Medium Mark D. When in 1923 the government design bureau, the Tank Design Department, was closed, for the time being any direct official involvement in tank development was terminated. But private enterprise had already taken over the torch. Vickers-Armstrong had built two prototypes of a new tank in 1921. In 1920 the Infantry had plans to acquire a Light Infantry Tank. Colonel Johnson of the Tank Design Department derived such a type from the Medium Mark D. In competition Vickers built the Vickers Light Tank. The Vickers design still was reminiscent of the Great War types. It had a high, lozenge-shaped, track frame with side doors but it also showed some improvements. There was a fully revolving turret and the suspension was sprung by vertical helical springs, while the Medium Mark C still had a fixed turret and was unsprung. The Vickers was really a light tank; it was small vehicle, just seven feet high and weighing only 8.5 short tons. It was driven by a separately compartmented 86 hp engine through an advanced hydraulic Williams-Jenney transmission, allowing infinitely variable turn cycles. The first prototype was a "Female" version with three Hotchkiss machine guns; the second prototype was "Male", its turret bristling with armament with the addition of a 3-pounder gun and a machine gun for anti-aircraft use. It had clearly been intended to give the vehicle a modern look: the turret, the front of the fighting compartment and the hull front plate were all strongly rounded. 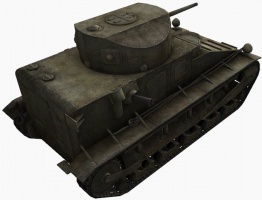 The advanced transmission proved to be utterly unreliable however and the project was abandoned in 1922 in favour of a generally more conventional design: the Vickers Light Tank Mark I, that would be renamed to Vickers Medium Tank Mark I in 1924 . The first prototypes were sent to Bovington for trial in 1923. The Vickers designation was A2E1. Despite being in general more conventional, in one aspect the Medium Mark I looked rather modern: instead of a high track run it possessed a low and flat suspension system with five bogies, each having a pair of small double wheels. The axles of these were too weakly constructed; as Major-General N.W. Duncan put it in his Medium Marks I-III: "(...) a perpetual nuisance. The axles were continually breaking and the path of the Mark I tanks was littered with discarded wheels". This was cured by switching to a "box bogie" in 1931. To ease repairs the suspension was not protected by an armoured covering. There were two vertical helical springs of unequal length in each of the five bogie casings attached to the hull. In front and behind the normal ten road wheel pairs, there was a tension wheel pair. Ground pressure was very high, even though at 11.7 long tons the vehicle was not very heavy for its size. The engine was an air-cooled 90 hp Armstrong Siddeley engine derived from an aircraft type. Surprisingly the engine and transmission was distributed throughout the hull - with the engine to the left of the driver, the gearbox underneath the commander and final drive at the rear, which Duncan describes as "an unbelievable retrograde step in view of war-time experience". The Medium Mark B and the Mark VIII had introduced compartmentalisation to reduce the debilitating effects of engine noise and fumes on the crew. However with the Medium Mark I considerations of ease of maintenance had taken precedence. The engine drove, via a multiple dry-plate clutch, a four-speed gearbox. It had no synchromesh and switching between gears without excessive noise was a challenge to the driver. A propeller shaft connected the gearbox to a bevel box at the end of the tank which divided the power to a separate epicyclic gear for each track. These gears automatically provided extra emergency torsion to the normal first and second gear if the vehicle suddenly slowed down due to an obstacle or soft ground. The petrol tanks were at the very rear of the hull, so the fuel lines had to run along the whole length of the vehicle, pumping fuel to a secondary tank that fed the engine by gravity. The engine was lubricated and partially cooled by oil; leakage was common and the original four-gallon reservoir had to be replaced by a 13.5 one. The tank could be electrically started, but only if the motor was already warm, so the first start had to be done by hand from the inside of the vehicle. Maximum speed was about 15 mph and the range about 120 miles. There was a cylindrical bevelled turret on top of the hull that carried a "Quick Firing" (shell and cartridge in one complete round) three-pounder gun (47 mm calibre) and four ball mountings for Hotchkiss machine guns. A novel, unique feature was a three-man turret. This meant that commander was not distracted with performing either the loader's or gunner's tasks and could fully concentrate on maintaining situational awareness. This gave a huge potential combat advantage, but went largely unnoticed at the time. Other manufacturers tanks did not have this capability until the German Panzer III was developed in 1937. The practical importance of this feature is signified by the fact that later into the World War II, most of both sides tanks' designs either quickly switched to the three-man turret, or were abandoned as obsolete. There was no co-axial machine gun. There was only room to operate one machine gun from the turret; normally one gun was switched between the respective mountings as the guns were removable. The turret machine gunner doubled as main gun loader. In each side of the hull was a Vickers machine gun. There was one gunner to operate these, he also functioned as a mechanic. The shape of the Mark I Medium hull was very distinctive. The back was a simple armoured box; the front plate was high and perfectly vertical. Between them, from the armoured hood of the driver at the right of the vehicle six armour plates fanned out to the left, making for a complex hull geometry at that side. In all the tank made an ungainly squat impression. The crew of five was only poorly protected by 6.25 mm plating, rivetted to the chassis, barely enough to counter the threat posed by light machine guns. With its many shot traps the vehicle was unable to withstand even anti-tank rifle fire and it had a high profile. The internal lay-out worsened this vulnerability as the petrol tanks were inside the main compartment. The Medium Mark I was the first tank to see "mass" production since the last of the ten Char 2C's had been finished in 1921. Indeed, as of the next tank, the Renault NC27, only about thirty were built, the British Mediums represented most of the world tank production during the Twenties. They never fired a shot in anger and their performance in a real battle can only be speculated upon but as the only modern tanks in existence in the decade after the First World War they provided the British with a unique opportunity to test the many new ideas about mechanised warfare using real operational units. The knowledge thus gained would prove invaluable in the Second World War. This page was last modified on 18 February 2017, at 05:37. This page has been accessed 109,783 times.